Powerful analytics software should make work easier, not harder. It’s easy to lose the big picture when using Cognos. Thrive, our own detailed Cognos dashboard, shows what’s happening in your user environment. Know which Users, Reports, and Packages are the most (or least) active. Plus, Thrive retains audit information across upgrades. Thrive helps you monitor the adoption of new features introduced in Cognos Analytics. The “User Adoption Dashboard” shows information about which users are logged in and are leveraging data modules, dashboards, and stories. Get Meticulous Insights with Advanced Reporting. 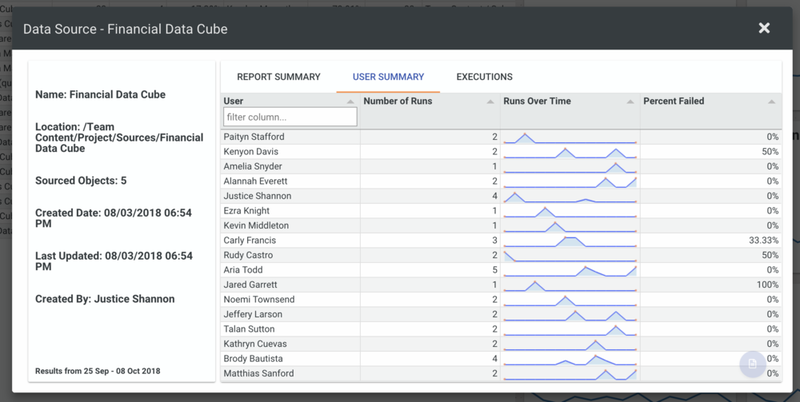 Click on any report item to explore granular details. Get in depth information about each User, Report, and Package in custom drillthrough reports. Thrive keeps track of what reports are failing, and who they’re failing for. With advanced details about error messages for specific reports and users, you can quickly navigate to problem sources and address them before they become widespread. Thrive works with Cognos 10 and Cognos Analytics. No matter your objective, you can use detailed insights on user trends, errors, and adoption to tailor and improve your business’s overall performance. Sign up for your free trial now to see how Thrive can help you reach your goals.